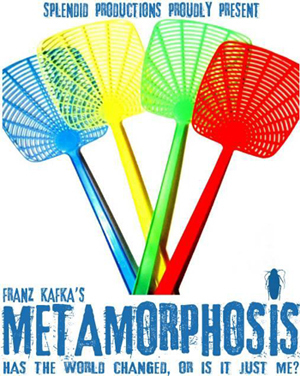 ‘The Metamorphosis’ was a novella by Franz Kafka, first published in 1915 in what is today the Czech Republic. A century on, the story retains its relevance and perhaps takes on new meaning as the ever growing power of computers, and the internet, continues to depersonalise things whilst individuals try to find meaning to their work in a digitalised world. The premise is straightforward enough of Gregor, a travelling salesman who leads a very routine and ordered life, getting up very early each morning and providing for his family until the day he wakes up to discover he has turned into a giant insect. From then on, there is a constant flow of philosophical questions as Gregor and his family have to come to terms with his new form of existence. A recurring theme is the question of what constitutes normality and the audience are invited to join in the search for definition as to what amounts to normal living. There are wider issues, such as isolation and dislocation which many can relate to, and with growing financial uncertainties and general pressures of life upon so many of us, perhaps explains at least in part why so many of the younger members of the audience were caught up with the production. Splendid Productions Theatre Company have taken Kafka’s story and whilst remaining true to the original novella, adapted it into a masterclass of physical and improvisational theatre. With a cast of only three, the actors present an array of both characters and objects (personified) at breakneck pace, imaginatively using minimalist props giving the overall effect of a much bigger production. For example, have you ever stopped to consider the personality of a heavy wardrobe or even a noisy alarm clock? This kind of surreal treatment in telling the story is completely in keeping with the psychotic nature of the plot and also helps bring over Gregor’s disengagement from those around him. The acting trio of Scott Smith, Grace Goulding and Jimmy Whittaker are a hugely talented ensemble. Each of them have only to remove their glasses and adopt a new stance for a new character to suddenly appear on stage. They not only demonstrate great versatility in voice and movement but in using many simple props to convincingly create the world of the house in which all the action takes place. This production is more than a modern re-telling of the Kafka story; it serves as an introduction to what it is possible to create on stage with the minimum of cast and budget, and it is easy to see why Metamorphosis is being seen by so many schools and colleges. It has to be said that this type of play, perhaps more than most, is not a production for everyone. Much of the audience, comprising several school groups, were enthralled from the start but a number of people did walk out, presumably bemused at the radical form of presentation and bizarre subject matter. Perhaps this demonstrates above all that this is the kind of presentation which demands thought and engagement from the audience and is certainly not a show which allows a neutral reaction. The vast majority of the audience appeared captivated from start to finish and there was genuine warmth in the generous applause at the end of the show, which suggested that overall, this production of Metamorphosis must be judged a triumph.